Welcome to my second installment about the Tarosophy Tarot Conference that I attended in Dallas, Texas from October 19 through 21. My friend Judy and I arrived on Friday in the late afternoon. Most of the people were out at a dinner and dance event, so Judy and I enjoyed drinks and dinner in one of the courtyards with a glorious fountain with a flame in the centre of it. It reminded me of an old temple of the oracle — appropriate! When the others got back, it was a great treat to catch up with old friends and connect in person with folk I only knew online. One of the beauties of such tarot gatherings is the creation and deepening of friendships. Barbara Moore is becoming more interested in how the human brain works. Her presentation focused on using different parts of the brain in our tarot readings. She stressed the importance of knowing what your reading style is. This includes knowing what each of us believes about how the future works, our role as a reader, and the role of a tarot reading. Barbara had us begin our sample tarot consultations with Scanning, a way of providing a sketch or foundation that can inform the rest of the session. This includes noticing the exteme numbers of, and/or patterns with regard to reversals, majors, courts, suits, numbers, and visual symbols. Barbara’s presentation was an excellent reminder to really “land” in a spread of cards before getting to the details. Enrique Enriquez‘s brand of tarot reading, based on pataphysics, shone in his session called “Patois Physique”. His visual approach, especially with the Marseille-style trumps, is very fresh in a field that often talks about meanings. Here is one of Enrique’s statements that not only cracked us up, but opened up our imaginations: “Asking questions of pieces of cardboard is crazy. This is why it works so well; it takes us out of the rational.” I enjoyed Enrique’s idea that the cards are a score for a performance and the notion that we can find something of a card in any other card. His reading style is rooted in these principles: elements that look alike are conceptually related; elements that are in the same position are related; link these elements by the words “turns into” or “becomes”. So simple, yet reliant on the practitioner being present enough to notice the details in every card. A great lesson in mindfulness! The later time slot contained three breakout sessions. I chose to work with Dr. Art Rosengarten whom I hadn’t seen in person in about seven years. Art offered a sort of council/ritual/experiential piece in which each of us drew a card from his deck, the Tarot of the Nine Paths, then spoke as a Council of Elders about the formation, intention, and growth of Tarot Town. On by one, we got into the centre and, as our tarot card character, posed a question about the community. People in the circle, as their tarot characters, took turns responding to each question. As the experience progressed, the questions and responses felt less “thought out” and more authentic. I felt myself entering a very sensitive and receptive state that allowed me to access the Magician within (that was my card). I appreciate(d) that Art took us to such a rich place in such a playful manner. After socialising and dinner, I gave my after-dinner presentation. Details about that are in my previous post about the conference. There was a late evening workshop on tarot and the “Lord’s Prayer” given by Katrina Wynne and Paul Nagy. Alas, I didn’t get to this one because I was already very full and satisfied for the day. Perhaps another participant can fill us in on the details of that presentation. Even after Day One of the Tarot Con, I was ready to say, “Hats off!” to Marcus Katz and Tali Goodwin for their vision and execution of this conference. It was a good first day. Stay tuned for the third installment about this very good gathering. Enrique Enriquez enriched our experience of the Marseille-style decks in his workshop, “Patois Physique”. Rana George enlightened us in the use of Lenormand cards. All of this brought home that my own entry into the world of tarot was through the 1JJ pack, a reproduction of a 19th century Swiss pack. I brought this deck into my after-dinner presentation on Saturday evening at the Tarosophy conference. How can we midwife the return of the ancient oracle? Ace of Pentacles, reversed. We can remember its deep cthonic roots and plant seeds of long-term commitment to the process. How can we make the process easier? Empress, upright. We can allow the birth to occur naturally and we can act as parents as well as midwives. Of what service is the tarot to the current generation? 9 of Swords, reversed. It acts as a portable philosophy conference where many beliefs can converge in one place at one time. Of what service can the tarot be to the next generation? Queen of Cups, upright. For them, it can be a relationship expert and a catalyst for the mature expression of emotional content. How can we ensure that the oracle endures? 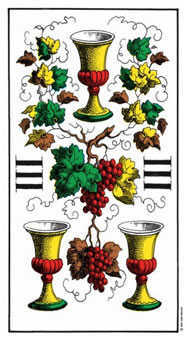 3 of Cups, upright. We can each clarify the nature of our relationship with the oracle, then we can promise to relate to it more often. This is only one piece of the Tarosophy conference in Dallas last week, one square of a marvellous quilt sewn together with a lot of soul and heart. More to come. Please offer your own impressions about the cards we picked in relation to the questions I posed in the comments section so that the conversation and re-emergence can continue. Yesterday, I offered a workshop that was an introduction to circle process, a very adaptable and collaborative conversational methodology that I use in many settings. The first part was informational. I gave people the basic principles, practices, and tools. The second part was experiential. We held a real council around real questions. Our first round of listening to one another was based on, “Please tell us a story about a conversation you’ve been part of that carried heart and meaning for you. What made that conversation different than others?” Even though this particular configuration of people had never been before, the sharing was honest and oftentimes moving. The second round grew out of the first, responding to, “What do these stories teach us about conscious, collaborative, circle-based conversations?” I could almost see the creative sparks behind people’s eyes as they spoke. Two things stuck with me from yesteryday’s gathering. First, taking time to slow down and really be with one another is so simple, yet it’s so vital if we want to remain connected. Whether seated in a formal council circle, chatting with a friend on the sidewalk, or calling somone we haven’t seen in a while, the intentional effort to slow down and make time for each other instead of making drive-by comments and sound-bite reports makes us feel good and strengthens the web of community. Second, the moments of silence were delicious. There were times when we simply waited to notice if anyone needed so say anything more. Everyone’s comfort with the pauses reminded me that we don’t always need to be filling each other’s ears with every thought that enters our minds. We can simply be in one another’s presence, savouring the quiet. All of this makes me think that it would be helpful for me to start up a council of silence, perhaps one per season. We could light a candle, check in with one another verbally, then sit in silence for 45 minutes or so. The circle could end with a brief check-out, then we’d extinguish the candle. Simple and presence-making. I’m grateful to all who participated in yesterday’s circle process workshop. You’ve heartened me and you’ve helped to plant a seed of something fresh and quiet. This autumn brings several teaching opportunities for me. On Saturday, I’ll be offering an afternoon to expose people to the simplicity and power of collaborative conversation, an introduction to circle process. Next week, I’ll be the after-dinner speaker at a tarot conference in Dallas, TX. Then an evening of tarot as a spiritual practice at Grey Heron in Maple, ON and an all-day workshop on tarot to navigate life’s challenges in Kingston, ON. In addition, some people are inquiring about reiki training. Why do I teach these things? What prompts me to gather with people and share what I know and practise? First, I like it. It’s enjoyable to meet new people and hold meaningful exchanges with them about things that interest us. Part of it is a social thing for me. Second, I’m told that I’m good at it. I’ve studied and practised various wisdom ways over the years and feel that I’m at a point in my life where it’s finally sinking in. One tends to be good at what one has absorbed. Third, it’s part of how I earn a living. Teaching classes and workshops is a stream of income for me. People who attend these often become clients and vice-versa. Fourth, and possibly most important, I owe it to these wisdom ways to pass them on in a good way. There’s a lot of rubbish out there about tarot, circle, reiki, and other paths of insight and growth. It’s a sacred duty to make sure that people who want to know more about them learn about them in a manner that is life-sustaining, useful, and respectful. I learned from excellent mentors; it’s my job to pass on their knowledge as excellently as possible. A desire to create experiences of common intention. Teaching helps me prioritise what roles I play in the world. Teaching experiences give me a sense of communal ritual. A blend of fun and purpose. A container for my creative energy is woven whenever I teach. Once in a while on this blog, I like to share books that nourish my mind, life, and work, hoping that at least one of them will inspire you. Here’s a list of some that I’ve been enjoying recently. Tarology (Enrique Enriquez). Definitely not your garden variety tarot book. Enriquez’s text is poetic and draws on pataphysics, the science of imaginary solutions. Through wordplay and visual rhyme, he reminds us to really look at the tarot’s images, to embody the tarot’s images, and to do as they do rather than what they say. Ruin and Beauty: New and Selected Poems (Deena Metzger). When I read Metzger’s pieces, I feel as though something in me is being reconfigured so that I can be a more life-sustaining presence on our planet. Bone-honest, these poems are candidly personal yet stir me to remember the universal. To read them is to participate in a ritual of reconnection. Metaskills: The Spiritual Art of Therapy (Amy Mindell). Whatever your way of being a helper or guide in these times, Mindell’s emphasis on following the ebb and flow of nature, especially within oneself and within the therapeutic experience, will free you to move beyond technique. This text invites anyone who offers healing encounters to experience their basic feeling attitudes and manifest their spiritual beliefs in a living practice. Wonderful! Why I Wake Early (Mary Oliver). I appreciate Oliver’s capacity to make the ordinary extraordinary. Whether telling us about beans, crickets, gardens, geese, or whalebones found on the beach, these works remind me to love my life in all its everyday experiences. Mindfulness in book form.